Will the price of gold keep going up in 2018? And are gold ETFs a good investment? Here’s a brief look at five that are worth considering. Exchange-traded funds, or ETFs, have existed since 1993, though they became much more common in the early 2000s. Since then, they have risen in popularity because they are a cheaper investment option than traditional mutual funds. ETFs represent shares of ownership of a unit investment trust that holds portfolios of stocks, bonds, currencies or commodities. They provide considerable flexibility in implementing various investment strategies and in building investment portfolios. 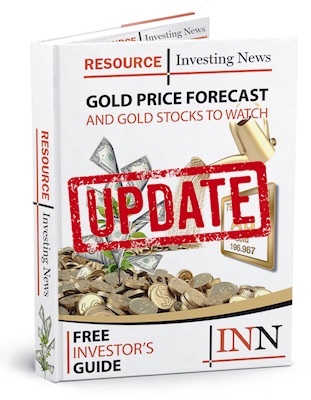 Gold-focused ETFs are fairly common today, and are a good choice for investors who want to have exposure to the metal without personally trading physical gold or gold futures. But which gold ETFs are the best? It depends on the investor, but the five gold ETFs below may be worth considering — according to ETFdb.com, they were the largest gold ETFs by asset value as of January 16, 2018. The SPDR Gold Trust tracks the spot price of gold bullion and is determined by market forces in the 24-hour, over-the-counter market for gold. This market accounts for most global gold trade, and any quoted prices available to ETF investors reflect the latest available information. Physical bullion comprises 100 percent of the ETF’s holdings, and its expense ratio per share is 0.4 percent. It offers investors a way to get involved in the gold market that is much less costly than purchasing, storing and insuring physical gold. Like the SPDR Gold Trust, the iShares Gold Trust aims to track the spot price of gold bullion. Its expense ratio for investors is 0.25 percent, and its holdings are allocated entirely to physical gold bullion. The aim is for the trust’s value to reflect the performance of the price of gold. The physical gold the trust holds is held in vaults in New York, Toronto, London and other locations. Investors can purchase and sell shares through traditional brokerage accounts throughout the trading day. ETFS Physical Swiss Gold Shares are issued by the ETFS Gold Trust (ARCA:SGOL). The aim of the ETFS Gold Trust is for its shares to reflect the performance of the price of gold bullion, less the trust’s operating expenses. The shares trade on an exchange like any other security, and can be created and redeemed as supply and demand in the market dictates and allows. The gold that the ETFS Gold Trust owns is held in Zurich, Switzerland, and it conforms to the London Bullion Market Association’s rules for good delivery. The trust holds a total of 820,562.61 ounces of gold. The PowerShares DB Gold Fund is a rules-based index composed of gold futures contracts. It is intended to reflect the performance of the price of gold. Its expense ratio is 0.78 percent. Specifically, thePowerShares DB Gold Fund tracks changes in the level of the DBIQ Optimum Yield Gold Index Excess Return plus interest income from its holdings of US Treasury securities, but minus the fund’s own expenses. It is designed for investors who want a cost-effective and convenient way to invest in commodity futures. The Van Eck Merk Gold Trust holds gold bullion in the form of allocated London Bars. The trust separates itself from others in that investors can take physical gold bullion in exchange for shares, right down to the ounce. In addition to London Bars, the trust dispenses 10-ounce bars and 1-ounce American Gold Eagle coins. Its expense ratio is 0.4 percent. The trust held 140,961,559 ounces of gold as of January 16, 2018. The fund describes itself as a cost-efficient way to invest in gold, although some believe its redemption fees are a bit pricey. Have you invested in gold ETFs, or do you want to? Tell us why in the comments below. This is an updated version of an article first published by the Investing News Network in 2014.